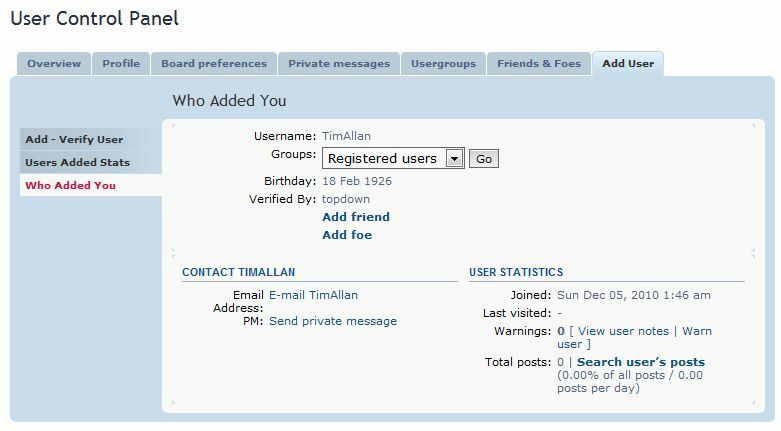 The phpBB3 Invitation Only mod allows you to create a tightly networked community having closed registration. The way it works is with a new registration module in the UCP where existing users register people they know. The standard registration is completely disabled (If you want)…. You may want to disable it after you get your initial users on board. But from there on, the only way new users are added is by someone already an existing user on the site. The mod allows them to pre-register someone they personally know and their account is marked Verified By the user that added them. As you can see above Custom Profile Fields that were set to the Registration screen also show up. The Verified By field is also a custom profile field but it is populated automatically and not editable. When a new user is added successfully the Admins receive a notification of Who was added and by what user. When you add a new user successfully (Passwords are generated automatically and kept private) the new user is sent an email. And the user added is added to a list Users You Added in the module. 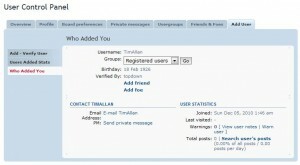 The above will even show if you disable viewing of profiles and the members list. There are no edits for this mod and it installs extremely easily. Simple upload the files and follow the included instructions. See the full instructions included in the package. The end result is a community of everyone is known by someone. Registration can be completely disabled for the forum so that the only way to be added to the community is by someone willing to verify that they know you. Minor Version updates are Free, Major Releases may cost extra. You are not allowed to re-distribute this mod in any way or form.